No 21 was built in 1911 for the Provident Cooperative Society. 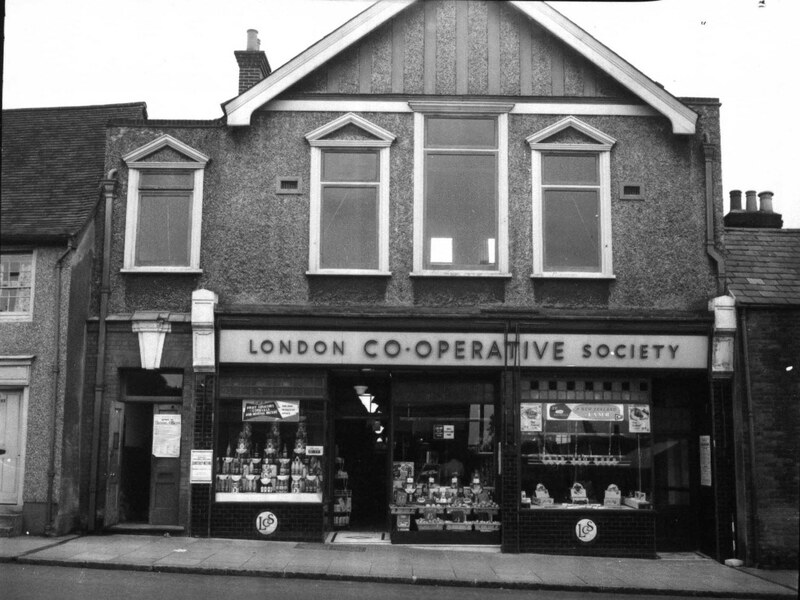 At the time of this photograph the store was run by the London Cooperative Society and comprised of two side by side shops. The butchers can be clearly seen on the right with the general grocers on the left. To the extreme left of the building the entrance to the staircase to the upper floor can be seen. Originally the upper floor was used for functions and concerts and was called the Cooperative Hall, it is now a Thai restaurant. This building is on the site of the Fox public house which closed in 1908. It is interesting to see that part of the building has gone full circle and there is now once again a butchers in the shop unit on the right. I used this barber or rather I was sent by mum or dad. The chaps who were the barbers were the same ones as those that used to be at “Vere’s” Hairdressers. Vere’s were in a building on the opposite side of the high street that was next door on the south side to Sheredays ( Dr Rilstones house and Surgery) The barbers at Vere’s were in a long room at the back of the building, the front of the premises selling handbags, luggage and travel goods. Upstairs was the Ladies Salon where I never ventured. Do you remember having to sit on the plank across the arms of the chair while having your hair cut. By the time I used to go to over to the barbers in the Butcher shop (Barbers and butchers have a bit in common – scalping) I didnt need the plank but was still asking for thinned and trimmed this being my style until I went bald. – No wonder the girls didn’t want go out with me! As well as a barber, he was also a talented painter, who had paintings for sale on the walls of the shop. I once saw him sketching Great Burstead Church when walking along Kennel Lane on my way to school. When I was a child at the end of the 1930’s / early 1940’s I belonged to the Ace of Clubs dancing school which met in the Cooperative Hall. We had a lovely uniform – a navy blue silk pleated skirt with a white blouse. We had a blue letter L on the blouse but I cannot remember what this stood for – can anyone else remember? The classes were for tap dancing and ballet. I can remember us performing at one of the town carnivals at Sun Corner.